Why does the Church set before us today both the Genesis account of the first days of creation and the healing ministry of Jesus? Because the God who brought order out of the formless wasteland, and who declared that all creation is good is the same God in Jesus Christ who, in his healing ministry, came to restore this sin-disordered world to its original goodness. The rabbi offers insight and a bridge between Genesis and Jesus. God continues to declare that God’s creation is good, but now reaches out to us in the person of Jesus, to heal the ills of sin, to restore what is broken. In other word, Jesus sees our potential, even in our brokenness, sees a potential he wants to transform to its wholeness. 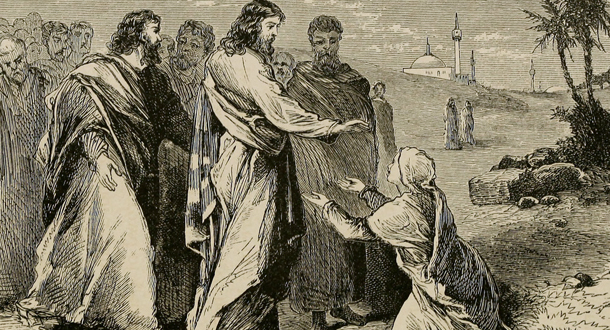 In today’s gospel the people flocked to Jesus, the New Adam, because they experienced in him the healing power of a new creation where we can hear God declaring as in the beginning “behold it is good.” The people are bringing the sick to Jesus, not thinking about themselves but about their broken brothers and sister. They sought “only to touch the tassel on his cloak; and as many as touched it were healed.” What is meant here is the tzitzit, pronounced “seet-seet,” the sacred braided threads that hung from Jesus’ Jewish prayer shawl. These tassels reminded them of the commandments God enjoined them to obey – to love God and to love their neighbor. That is what the crowds were doing in today’s gospel. In loving obedience, in touching Jesus’ tzitzit, they were caring for and touching those in need of healing. Isn’t that how creation will be restored? Like them, we too are called to partner with Christ, to touch the broken and suffering, to heal the world –and to help bring about a restored new creation. Deacon Manuel Valencia is on the staff at Mater Dolorosa Passionist Retreat Center, Sierra Madre, California. Error: Error validating access token: Session has expired on Monday, 18-Mar-19 14:16:37 PDT. The current time is Thursday, 18-Apr-19 19:51:43 PDT.